I was waiting my final FSS shipment from the G.I. Joe Collector’s Club to arrive before posting this but apparently today was not the day! The final delivery which features Oktober Guard members Dragonsky and Big Bear has started to arrive in mailboxes across the U.S. Given that these two figures were the last two in the 12 figure stated roster there’s no outcy over “spoiling the surprise” on these. I have to admit– I’m a bit torn over how I feel about this figure. On one hand, I’m a HUGE fan of the original 1982 roster as that was when I first started collecting G.I. Joe: A Real American Hero. Grand Slam was the first casualty of my then-new puppy who decided to chew the living daylights out of him one evening. As such the red pads version of the character has always been a bit of a tragic figure for me. On the other hand, we just received Bombardier in that last shipment and he was a straight-up repaint of the original 25th Anniversary Flash. The GIJCC version of Grand Slam marks the fourth time that this character has been released in the “modern era” of G.I. Joe and three of those times will have been as a straight repaint- right down to the head sculpt. As incentives go, it’s pretty lackluster. 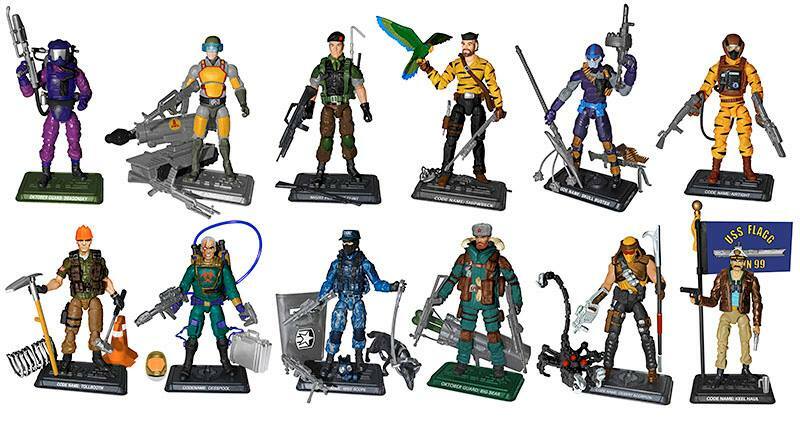 Sure, it’s a great cost-saving method for the Collector’s Club but it’s not quite up to the “premium figure standards” that the FSS was touted as having. It kind of takes the wind out of a collector’s sails to realize that two $30+ figures in one shipment are mostly straight repaints of figures from earlier waves. Right now, the Joe fandom is in a pretty bad way. The highly anticipated 50th Anniversary of G.I. 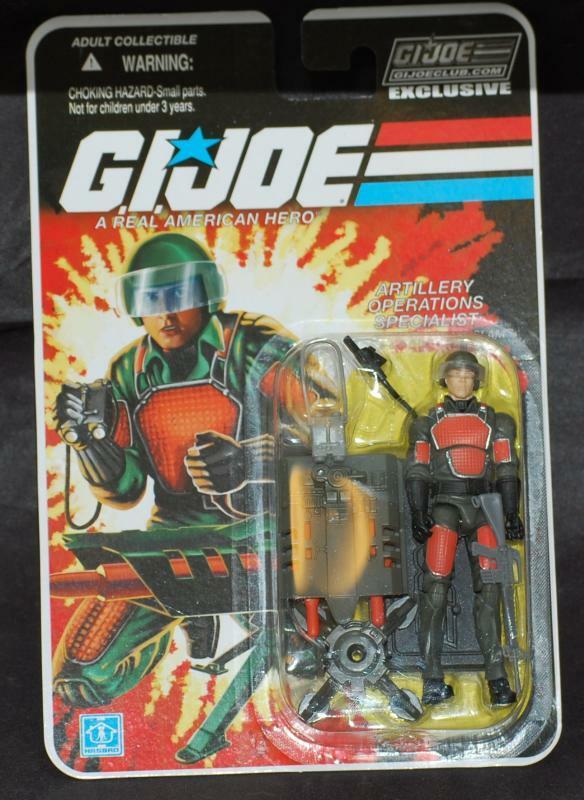 Joe announcement at Toy Fair turned out to be the “32nd Anniversary of A Real American Hero” with a bunch of repaints and concept case figures. The most-recent G.I. Joe design team at Hasbro has been utterly dismantled and the members dispersed to other brands. It’s been revealed that Hasbro will NOT have an official presence at the 2014 G.I. Joe Collector’s Convention. What should have been a banner year for the brand is turning out to be anything but… and the fandom is seemingly more polarized than I’ve seen it in a while. Still, I’m kind of happy to see Grand Slam get some attention– if only for my own nostalgia. Do I think that this was the way to go with him? Absolutely not– a new/different head would have gone a long way with winning over folks who don’t necessarily feel that they’re getting their money’s worth from this. From a marketing standpoint, the final figure in a subscription should be one of the strongest. It’s the last impression before members are asked to subscribe for the subsequent year and it should really pull out all of the stops. Sadly, someone at the Club thought that this was the way to go and as a result poor ole James J. Barney is getting the brunt of it. Knock on wood my shipment arrives tomorrow. Expect reviews to follow in the next week here at JBL. In the meantime, feel free to leave your thoughts on this below. Was this really a worthy choice for the 13th slot? This entry was posted in Collector's Club, Toys and tagged 1:18 scale, A Real American Hero, Big Bear, Collector's Club, Dragonsky, Exclusive, Figure Subscription Service, Grand Slam, Toys by Fred Meyer. Bookmark the permalink. You won’t find a bigger Grand Slam fan out there than me, but this was not a worthy choice at all, certainly not for the 13th figure. At most, it should have been included in the regular pairings to offset a Boss Fight Studios head sculpt, but that was already Bombardier’s role to begin with. This all reflects on the brand’s current state at present. I did not know that the G.I. Joe design team had been dismantled. I guess it really is 1994 (or worse) all over again, so we better make the most out of those Toys “R” Us “32nd Anniversary” items (if we find ’em) before the fat lady sings. It’s a sad time to be a Joe fan, really. For its 50th year, the brand is going out in a fizzle rather than looking forward to 50 more years of greatness. I think this is a great figure. Unfortunately, as everyone else has said, it shouldn’t be a $30+ figure at this point in time. I am tired of getting fleeced when there are perfectly good vintage toys to buy at good prices. As a true fan, I am utterly disappointed in Hasbro and the Club. I have never seen two companies with so many folk lined up to give them $$$, but they blow it by dicking us around and cheapo-half-assing it.